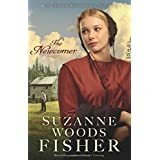 The Newcomer, Amish Beginnings book 2 by Suzanne Woods Fisher is the book everyone who read Anna's Crossing has been waiting for. I enjoyed reading Anna Konig's story about crossing the Atlantic in the Charming Nancy. In the end I wanted to know more about this resilient young woman who fled religious persecution in Germany to an unsettled land so far from the beloved grandparents she left behind. Our story begins in October 1737 in Philadelphia. Anna and her fellow church family are waiting to disembark and move to the land their bishop Jacob Bauer purchased just a year before. Jacob's wife Dorothea and his youngest son Felix; Christian Muller, the Amish minister and his wife Maria and daughter Catrina; Isaac Mast and his grown son Peter as well as Josef Gerber and his wife Barbara along with their twin toddler boys and Simon Miller. On board ship, Anna met and fell in love with Bairn, the ship's carpenter. As it turned out, Bairn is the son of Jacob and Dorothea, who was thought to have been lost at sea on Jacob's first Atlantic crossing. One thing I enjoyed about the story to begin with is that it is historical fiction. Suzanne is a master story teller and her research is superb. I like how she can weave historical characters like Benjamin Franklin into her stories. In this book in particular, she captures what we know is his jovial nature when he befriends 8-year old Felix. He encourages Felix and the boy learns first hand the importance of learning the language of his new home to keep his inquisitiveness alive. Felix, whose mischievous nature thirsts for excitement leads us on antics that help to neatly tie up the story as he brings people together. Bairn, for his part, long separated from his family and church is indecisive about what his future holds. Can he avoid the call of one more call from the sea? Can he go back to the Amish ways he was removed from so many years ago? Is his love for Anna enough for him to stay for a life with her? Complicating matters is the arrival of a newcomer, Henrik Newman who arrived on another ship from Germany. He is charming and he is eager to please everyone he meets. He is a take charge man who seems to have answers for everything. He is taken with Anna but can she give her heart to him when she has already given it to an absent Bairn? When the party is finally on land they are separated from Jacob once more as he and Dorothea journey ahead to their new settlement in the wilderness near the top Schuylkill River. When the others followed, joined by the newcomer only to arrive at an empty cabin. Nothing, so far turned out to be what everyone thought it would be. It would be unfair of me to truly give away the whole story. I will say though that continues to amaze me how our country was settled. In a land so vast and unsettled it would have frightened me to be so removed from the life I was accustomed to. Resilience, courage and a strong faith kept them going. Among all that were real people. I thank Suzanne for bringing their stories alive. Suzanne Woods Fisher is an award winning, best selling author, who is well known for her works in Amish fiction and non-fiction. I heartily recommend this book along with book 1 of this series, The Charming Nancy. Each book can be read as a standalone copy but it if you are like me you want more to the story. Who gets the girl you wonder? Read the book to find out. It is available at your favorite bookseller.